a half million refugees out of a population of four million, Lebanon has the highest proportion of refugees world-wide, and one of the highest in absolute numbers. The country has received more refugees from Syria than the entire European Union. 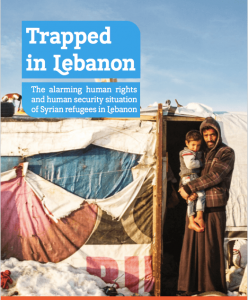 PAX and ALEF believe that a lack of political will and courage to achieve a drastic improvement in the situation of refugees from Syria in Lebanon could have serious consequences, not only for the security of refugees, but also for the Middle East and Europe. The harsh conditions of refugees living in Lebanon only encourage further migration. While some might take the risk to return to Syria, many more will actually try to reach other countries, in particular Europe. The tensions could lead to further destabilization of Lebanon. Violent extremist groups persistently try to mobilize among the desperate refugee population and find new recruits. Seeking durable solutions is in the direct interest of the refugees themselves, Lebanon, as well as the European countries.